Club Penguin Cheats by Mimo777 Club Penguin Cheats by Mimo777: Club Penguin Musical Instrument Reviewed By You! My favorite would be the piano because you can give a soft tone or something to rock with! Also you can go so high or so low depending on the mood. You can create a master piece with the piano! I play the piano and write songs all the time, I do this because it either makes me feel happy,sad,anrgy, and maybe it just makes you want to dance! That i swhy I like the piano the best! Waddle on Cp! For next weeks review, Club Penguin wants to know what you think about all the different songs in Club Penguin. Which one is you favorite and what do you like about it? Good work Sunihh! And Mimo, recently my comments have not been coming up at all. MAYBE they've been a little long but why aren't they showing up? 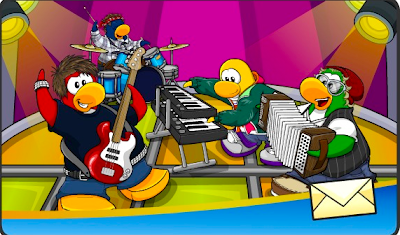 The picture of the band right there might be the new outfits for the Penguin Band!!! It just might be!! Hey Mimo, i just noticed that when you go on the june membership page it shows the same vip pass as last year!!!! MIMO! I found a glitch. When you go to Puffle Launch (in the pet shop. Not the one you earn), if you click nother world other than Blue Skies, then all the levels go away! And when you click on Blue Skies again, all those levels are gone! Mimo! My sister, Chippyg, has found something on clubpenguin. people can't take the test anymore to become an agent of the epf. the invite is gone! Do you think it will return? when do you think clubpenguin will realize this?